Welcome to the Hotel Ivanhoe, also known as the Roberts Hotel, Ferndale Hotel and Italian Swiss Hotel, was the first and is the last of the original hostelries in Ferndale. Built in 1870, it was burned to the ground and rebuilt in 1875, then remodeled in the late 1890s. After a second fire in 1943, the upstairs hotel closed its rooms for 58 years. It's reopening on March 12, 2001 restored its role as "… the oldest, most westerly hotel in the continental United States." 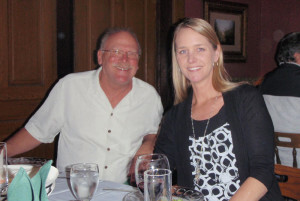 Owners Dave and Barbara Mogni welcome you this restored historic gem. The Ivanhoe is Ferndale's original hotel, and offers historic accomodations for the traveler who seeks lodgings with true vintage character. Start your evening in our restaurant with a scrumptious dinner and dessert. 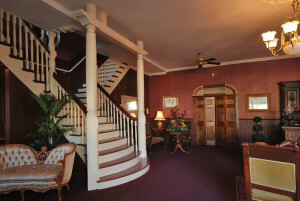 Then join in with the musical festivities in the saloon, or grab a book and sit by the fire in our comfortable lobby. Later, stroll up to your spacious guest room furnished with Victorian antiques. Some rooms have brass beds and clawfoot tubs for that romantic touch, while other rooms feature king size beds and roomy showers. Which ever room you choose, you'll be sure to enjoy your stay at the Hotel Ivanhoe in Ferndale, California. 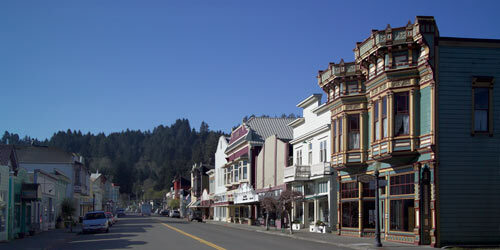 The Victorian Village of Ferndale has long been recognized as Northern California's best preserved Victorian small town. Main Street boasts a fine collection of historic commercial buildings and throughout the town and surrounding farmland you will find stunning examples of Victorian mansions and other historic homes. Located near the rugged and scenic North Coast seashore and surrounded by giant redwood forests, Ferndale remains an unspoiled gem. Here life takes on a slower pace and people take time to enjoy the beautiful sunsets, the fresh air, and the many recreational opportunities that are nearby such as hiking, canoeing, hunting, fishing, bike riding and photography. Ferndale California is located about 20 miles south of Eureka, in Humboldt County, just a short drive off of Highway 101. Ferndale's convenient location makes it ideal to use as a base for exploring the pacific coast and the giant redwoods. Our weather is moderate year round which makes us ideal for those seeking to escape the cold of winter or the heat of summer. But come visit us for the Kinetic Sculpture Races or for our Victorian Christmas or any other of our special events and you'll see why so many people fall in love with Ferndale the moment they arrive here. The Ivanhoe, as it is known by locals, attracts visitors that like a good meal, a chance to mix with friends or make new ones. The Hotel, Restaurant and Saloon are closed Monday and Tuesday, as well as major holidays, New Year's Day, Easter, Thanksgiving and Christmas. © 2001-2018 - Hotel Ivanhoe - All Rights Reserved.